Virginia Knightley is a brilliant news journalist, a young television producer who, after finding a missing person report on her desk, becomes caught up in a world of corruption and cover-up. Virginia is drawn to the disappearance of Evelyn Carney, an up-and-coming lawyer whose sudden vanishing act seems to make no sense. Knightley begins an investigation which gradually leads her into a situation where she has to face old demons and new enemies. Her ex-lover, Commander Michael Ledger is at the fore of the police investigation. Her new boss Nick Mellay seems determined to remove her from any power as he effectively demotes her during a staff reshuffle. Add to this her problematic relationship with anchor man Ben Pearce; just friends and colleagues, or something more? Life is not easy and it could get worse. Kovac has written an entertaining crime thriller. Virginia is an interesting character, with intelligence, inner strength and a near-photographic memory. She realises that she has seen Evelyn Carney before in a news video and so is determined to uncover the truth. Her eye for detail is crucial to the plot but things may not turn out as she hopes. The further involved she becomes the more complicated the situation becomes, to such an extent she does not know who is telling the truth nor who she can trust. 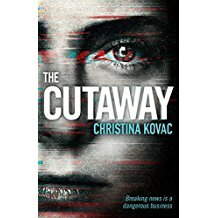 I enjoyed the novel and admire Kovac’s ability to keep the reader guessing. The cover blurb on the paperback says, “The Newsroom meets Gone Girl”. Although there is a newsroom, it isn’t that. It is its own novel and all the better for it. This paperback edition contains a 4-page Q&A with the authoress.